Donna Burick is a recognized expert in the fitness industry and has been a personal trainer for more than 20 years. She was successful as a group fitness instructor and fitness director in the Detroit area before opening her own fitness studio in May of 2005. Through her company, 3dFit, Donna presents a full series of classes, including spinning, Pilates, kick boxing, yoga and sports conditioning. She is best known for her signature BootCamp, a highly concentrated 4 hour a day, 5 day a week program designed to kick-start a workout program or push through plateaus. Donna holds certifications from both ACE and ISSA and a spinning certificate from Johnny G.
Her passion for healthy living is the basis for inspiring people, including models and pageant contestants, kids of all ages and individuals with a sincere interest in fitness and sound nutrition. Donna's philosophy of motivating her clients through accountability and consistency to help them see their potential is her greatest reward. The importance of building personal relationships with those she trains through coaching and follow-up has proven extremely successful. She recently launched a new corporate wellness program with the goal of providing employees with a sound fitness and nutrition plan to help reduce health care costs and increase productivity. Her studio has expanded to triple its size since opening and now includes a spa with specialized services including massage, facials, manicures and pedicures. Through all of her education and training it is Donna's desire to reach out to as many people as possible to impress upon them the importance of "fitness", and to provide instructors, personal trainers, coaches and people who hire her with innovative ideas to reach their goals. 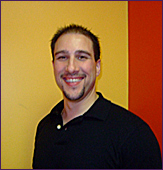 Tom Burick is one of the owners of 3dfit, Inc. and a 3dfit master trainer. Along with his wife, Donna, founded the company with the three major factors they feel relate to training: Desire, Discipline and Dedication. Tom is adamant that nutrition is the groundwork that gets your program off the ground and fuels results. An advocate for a healthy lifestyle, he thinks resistance training is an essential part to any program, along with cardiovascular training and, of course, a good sound nutrition plan. Tom has trained a wide variety of clients to achieve their individual goals. In the last year has had 3dfit hand picked to begin training at Power Shot Hockey Academy in Livonia owned by former NHL star Mike Donnelly and St. Louis Blues scout Craig Channell. Tom is currently training to step on stage in competitive bodybuilding and is able to help anyone interested in doing the same. He has a great network of top athletes in the field and can have any question answered with fact-based research. "I can't stress enough to my clients that a good nutrition plan is key to success. Once you start to see results from our guidance, you get hooked and when that happens, look out. That is when the client sees what hard work and planning can do for them." Stop by and meet all our trainers. Copyright © 2013 3d Fit. All rights reserved.